1st T20I, SA v SL: The edge-of-the-seat thriller was won by the hosts, thanks to David Miller's 23-ball 41. 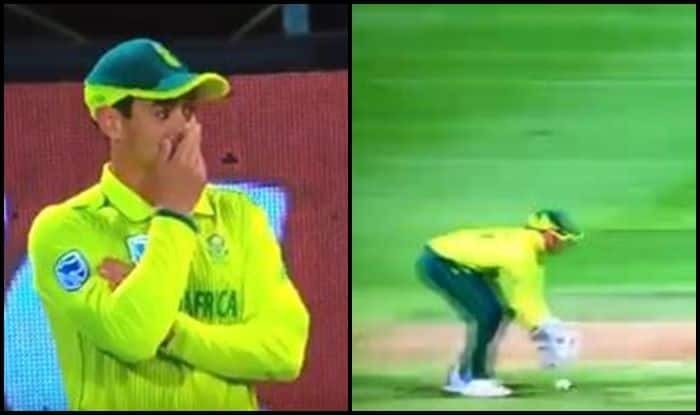 South Africa vs Sri Lanka: South African cricketer Quinton de Kock could not keep a lid over his emotions as he burst out laughing after wicketkeeper David Miller’s schoolboy error. Miller was donning the gloves and not De Kock. The latter was in the outfield without the gloves. The ball was thrown to Miller, it was rolling and Miller could not gather it as it went for overthrows and conceded an unnecessary run. Usually, it is De Kock who puts on the gloves and knows how it feels like to commit an error like that. It was like rubbing salt on Miller’s injury. Meanwhile, South Africa edged out Sr Lanka in a Super Over face-off. The 1st T20I ended in a tie as both teams ended up scoring 134. In the Super Over, Imran Tahir did the trick for the hosts with the ball as he conceded merely six runs defending 14. David Miller bagged the Man of the Match for his 41 off 23 balls. He also starred in the Super Over where he managed to hit a six and a four. “It was a little bit longer than we expected. Did not expect the Super Over. But a great game of cricket. We had just 5 minutes to gather our thoughts and come out. Rassie and I are were going really well, but we lost his wicket and my wicket was unnecessary to be honest. I don’t think you do (know the target in a Super Over). We spoke in the break and thought 10 would be a good score. I have no idea (if I will keep in the next game), we will see how it goes,” said Miller at the post-match presentation.